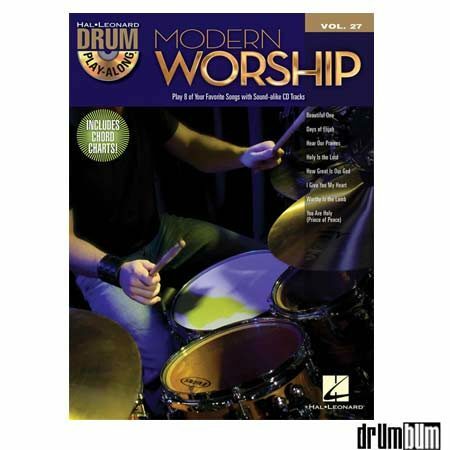 Modern Worship Drum Play-Along Book/CDs – Play your favorite Modern Worship songs quickly and easily with the Drum Play-Along« series! Just follow the drum notation, listen to the CD to hear how the drums should sound, then play along using the separate backing tracks. The lyrics are also included for quick reference. The audio CD is playable on any CD player, and also enhanced so PC & Mac users can adjust the recording to any tempo without changing the pitch! Includes: Beautiful One ò Days of Elijah ò Hear Our Praises ò Holy Is the Lord ò How Great Is Our God ò I Give You My Heart ò Worthy Is the Lamb ò and You Are Holy (Prince of Peace), plus chord charts! Softcover Book approx. 9″ x 12″ and 48 pages.